Beautiful, modern, light-filled spaces are available for rental in the ODC Dance Commons and ODC Theater buildings. Whether you need one studio for a dance rehearsal or performance or a combination of spaces for your event, please contact us so we can customize a rental package to meet your needs. In 2010, our campus re-opened the renovated ODC Theater, with three more studios and a brand new, technically improved, 170-seat Theater. Please review our Studio Rental Policy. 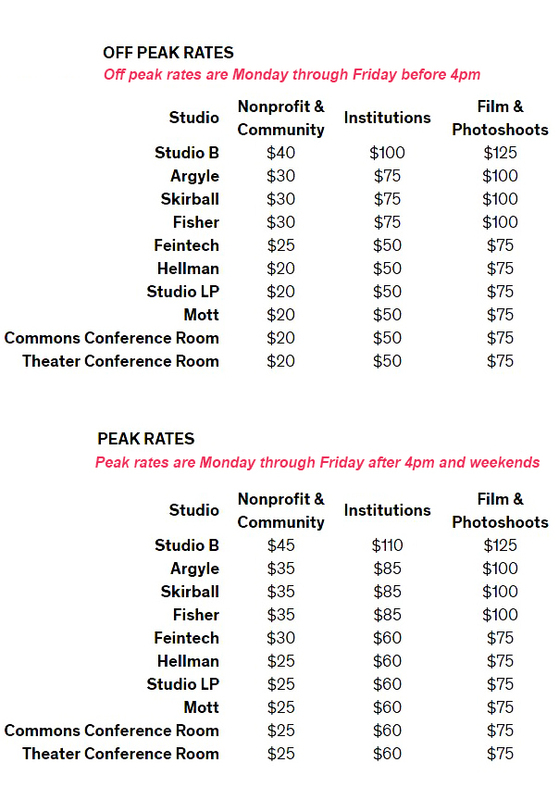 Please see our hourly rates below (updated 5/25/17), review current studio availability, and fill out our rental request form to book a space. Visit our Theater & Performance Rentals page. This 1,500-square-foot studio has a brown Marley floor, a skylight, and an intimate feel perfect for smaller rehearsals. 51 ft. X 31 ft. This 2,000-square-foot studio features a pyramid skylight and is ideal for a variety of modern technique training. 51 ft. X 41 ft.
Named after an early 20th century prima ballerina, this beautiful 2,000-square-foot studio has a wood beam ceiling and skylights that provide a light-filled and airy setting for classes and rehearsals. The Argyle Studio is our primary ballet studio. Rhythm & Motion’s Essential Rhythms and Advanced Ballet are popular classes in this space, and many local dance and music groups choose it as a favorite rehearsal space. 48 ft. X 44 ft. This 2,000-square foot studio has hardwood floors suitable for tap and flamenco. Filled with natural light from the glass storefront, this studio can be observed from the lobby. The Dance Jam regularly rehearses in Skirball, while adults enjoy Tribal Belly Dance, Rhythm & Motion workout classes, and Contemporary. 44 ft. X 44 ft. This 3,000-square-foot studio is a rehearsal space with retractable seating for 94 audience members. ODC/Dance Company hosts its Unplugged series in this gorgeous space, along with several informal performances and open rehearsals throughout the year. Rhythm & Motion's Fusion Rhythms, Hip Hop, and Contemporary technique classes make the space burst with energy and music all year round. 50 ft. X 61 ft.
For rehearsals, please fill out our rental request form. A favorite among tap and flamenco dancers, Hellman studio offers an intimate setting for solo and small group rehearsals. 29 ft. X 22 ft.
As our only studio without mirrors, the Mott Studio is perfect for improvisation or preparing for an upcoming performance. Located on the third floor of the building, the Mott studio offers wonderful views of the surrounding neighborhood. 34 ft. X 22 ft. Studio LP features light gray Marley floors and a bright, clean feel for small group ballet and contemporary dance rehearsals. This room looks onto a Japanese garden and features a stunning handcrafted conference table with seating for 20. Please note: Within the conference room are housed two offices that are likely to be accessed at any time of day. The kitchen near the conference room is for staff only. The theater building conference room features floor to ceiling windows with ample lighting and room. It is adjacent to both a unisex restroom and an elevator. 34 ft. X 16 ft.